“Dreams and Ambiguity on Svevo’s European Stage: La rigenerazione and A Midsummer Night’s Dream,” for a volume on Svevo and Shakespeare. Ed. Carmine G. Di Biase. Annali d’italianistica. Studi e testi. Series directed by Luigi Monga & Dino S. Cervigni. Below is the first paragraph of my article and a list of its sections. This collection, edited by Carmine G. Di Biase, contains a range of essays that address the relationships between Svevo and Shakespeare (and their works), as well as information about recently discovered, relevant Svevo materials and Di Biase’s translations of Svevo’s “Profilo” and Ariosto governatore. The work of Brian Moloney, Riccardo Cepach, Elisa Martínez Garrido, Carmine G. Di Biase, and myself appear in the volume. It offers new views on Svevo from a variety of perspectives. The volume will be presented in Madrid and Trieste. In 1884 Italo Svevo sent the renowned actress Eleonora Duse an Italian translation of Romeo and Juliet with the note, “Il sottoscritto si permette offrirLe pella rappresentazione questo suo dramma che scrisse proprio pensando a Lei. Non chiede altri diritti di autore che quelli che la legge in vigore quando visse gli concedeva. 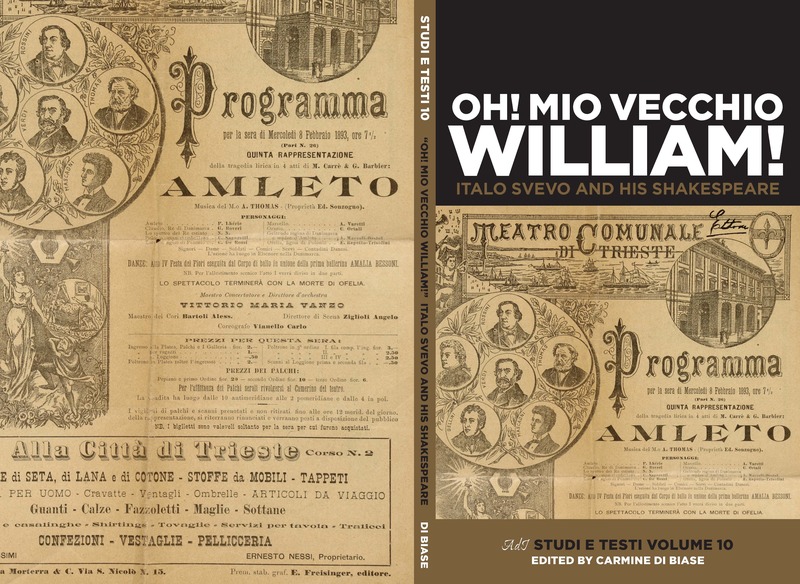 — G. Shakespeare.” Much has been made of Ettore Schmitz’s pen names and this signature is similarly significant: addressing Duse as Shakespeare reveals not only Svevo’s playfulness, but also his personal association with the Bard. Even Romeo and Juliet, which at first glance may seem to have little in common with Svevo’s forma mentis, was a work he treasured enough to share with the formidable actress. Although Svevo primarily mentions the tragedies, like Hamlet and Romeo and Juliet, the magnitude of Shakespeare’s significance to Svevo and the humor of Svevo’s own plays suggest that Svevo’s relationship to Shakespeare’s comedies is also worth exploring. This essay investigates Svevo’s engagement with a comedy that has often been compared to Romeo and Juliet, A Midsummer Night’s Dream. First, I consider the various cultural conduits through which Svevo would have received Shakespeare’s play to reveal the necessity of thinking about Svevo in the context of a broader European and even world literary culture. I then put Shakespeare’s play into conversation with Svevo’s La rigenerazione in order to explore Svevo’s rich representation of reality, of perception, and of performance itself.